Amazing Galveston island get-a-way with Beach across the street! located on the Seawall. Watch the ocean waves, hear the seagulls, all while sitting at the balcony drinking your margarita! The beach and island experience will be found at this condo! Take the time to read our many guest reviews! The amenities and decor are phenomenal! The 2 large bedrooms with 2 full bathrooms are perfect for a family of seven! The master bathroom has granite counter tops, a his and hers sinks and a spacious, modern glass enclosed shower! When your surroundings are beautiful and you're sleeping in a high end posterpedic mattress you will wake up refreshed, energized and ready to enjoy your island stay! For your convenience, Moody Gardens, Schlitterbahn Water Park and the Galveston Convention Center are only a mile away! Close enough to come back, take a rest and then rush back to the excitement! Our condo is in a gated community surrounded by lush tropical landscaping, 2 resort style pools, heated spa tub, and a full gym with elliptical equipment and free weights. You can workout at the fitness center and to finish your workout dive into the swimming pool. Relax at the swimming pool with a great book and begin your gorgeous suntan. The large 54 inch flat screen TV will be a welcome in the evening as you relax and laugh over the day's events with your loved ones! Or just sit at the balcony and watch the ocean waves at the beach and listen to the seagulls! A smaller flat screen TV is located in the second bedroom if you prefer to watch your favorite cooking or sports channel while reclining and relaxing on the bed! We now have beautiful laminate floors in our bedrooms for a clean, modern look. You will absolutely feel like you are in a tropical paradise and you don't have to travel to the Caribbean! This beach condo has stainless steel appliances, full size washer/dryer, fully equipped kitchen with everything furnished to make your perfect meal! Just bring the food! One mile to Moody Gardens, and Schlitterbaun Water Park and the Strand Historic District for shopping and enjoyment is only 4 miles away. This condo is SPACIOUS with a fantastic view of the ocean; located right by the seawall which is a great place to ride your bicycle or run your morning jog! 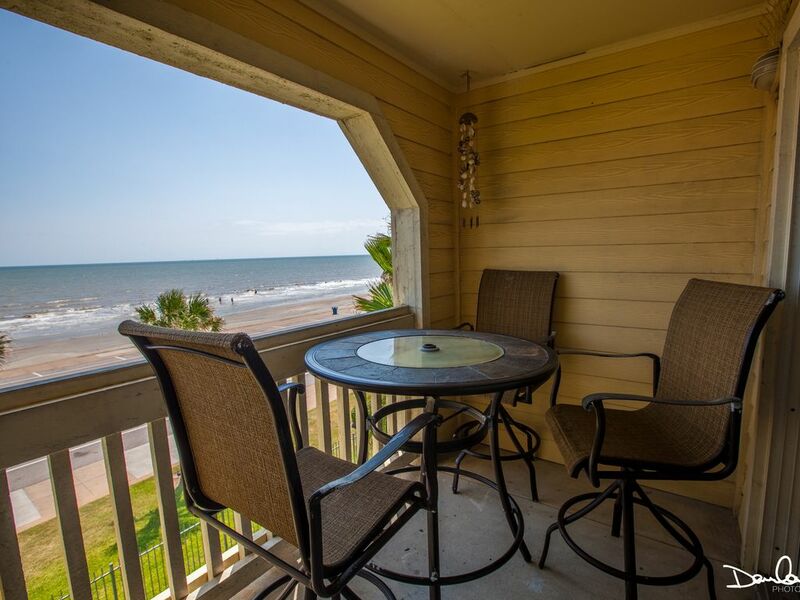 You will NOT easily forget your Galveston island vacation at our beach condo! WANT A LUXURIOUS BEACH HOME INSTEAD? See listing [HomeAway # 973827; (www.vrbo.com/171473] and [HomeAway# 973830; (www.vrbo.com/300295)], both homes are located SIDE BY SIDE and only steps (2 minute walk) to the Beach! Great for a large family get-away. The second bedroom is beautiful in its decor and has a queen size bed. We have a twin size mattress in the closet that can be pulled out for the little one! The second bedroom has a tub/shower combination ideal for the little 'fishes' in your family! The queen size sleeper sofa can be found in the spacious entertainment room. All appliances are 'top of the line'. Our condo has granite countertops from kitchen to bathrooms. If you must wash, remember, we do have a full size washer and dryer in the condo! I am a retired nursing professor who taught at San Jacinto Community college for 32 years.I enjoy interacting with people and I find that renting my beach homes/condos givea me that opportunity! I grew up in Victoria, Texas, graduated from Victoria High School, attended Victoria Community College and received my bachelor's degree in Nursing from Dominician College in Houston, Texas. I have a Master’s Degree in Science (University of Houston; Clear Lake Campus) and a Master’s Degree in Nursing from the University of Texas Health Science Center. I currently live in La Porte, TX by the ocean that I love so much! Our condo is close to all the attractions, One mile from Moody Gardens and Schlitterbahn and has 2 great swimming pools, a heated spa and even a 24 hour fitness center! There are community BBQ grills near the swimming pool areas. We are also 1 mile from the Galveston Convention Center! The management team has a full time person to make sure the grounds are nicely kept and the swimming pools are ready year round. Our guests who stay at our condos always want to return, I CAN'T SAY ANYTHING BETTER THAN THAT! Doc and I work hard to make our condos the perfect stay. The ocean views are AMAZING and the spacious double sinks with the large, modern glass enclosed shower in the master bathroom is unique and not easily found in other condos! I have traveled extensively and stayed in many expensive hotels and resorts and this condo's ocean view and location is among the best! I only needed to bring the outside ocean beauty inside which is proven by my guest reviews! I can't say enough about the great location - Schlitterbahn Water Park, Moody Gardens and the Galveston Convention Center are only 1 mile away. AND the Strand Historic District for shopping is only 4 miles away! The Pleasure Pier is close by. We are located at 7000 Seawall Blvd. Very conveniently located! We strive to provide superior furnishings to make your stay a resort experience! toilet, shower, Very spacious; has double sink with plenty of counter space! toilet, combination tub/shower, Beautifully decorated! The Master bedroom has a spacious tiled shower with glass enclosure (very luxiours and spacious). Double sinks are found in the master bedroom for his and hers personal space! The second full bathroom is also lovely and spacious with its tub/shower combination. The beach is .5 miles from the condo if the ocean tide is in. The beach can be accessed from across the street if the ocean tide is out. You are able to enter the beach from across the street when the tide water is out and you get a great unobstructed ocean view and breeze from the balcony. Fantastic ocean view especially during a full moon! See and hear the ocean waves from the balcony! View the dolphins in the water and see the coastal birds in the air! Located across the street from the ocean at the seawall. bed linens are included! You will find the beds ready to lie down! Very spacious with large screen TV, balcony from this room has a fantastic view of the beach and ocean. ceramic glass top on the stainless steel stove. oven available for cooking that great casserole or heating up a pizza! Upgrades appliances that you would have in your own home. We have glass dishes and also have unbreakable dishes for the children! Balcony facing the ocean with its great view and wonderful gulf breeze! - Enjoy breakfast or an evening dinner with the waves dancing under the moonlight! Condo has a full size washer and dryer in the unit for your use. No need to take dirty clothes home from your vacation! Stainless steel glass top stove, full size stainless steel refrigerator with water dispenser on the door. Refrigerator is a side by side with the spacious freezer for storing your ice cream. Microwave available along with a fully furnished kitchen with all appliances (minus the food). We have dishes, cook ware and eating utensils. We try and provide everything you will need minus the food. Linen and bath towels provided. Please bring beach towels YOU WILL LOVE COOKING IN THIS KITCHEN!! We enjoyed our stay!!! No complaints other than the sliding patio door needs repair, sometimes it was hard to open. Otherwise, the unit was great!!! The condo is beautiful and clean. We enjoyed our stay! Thank you for the lovely review, Doc and I greatly appreciate you enjoying your stay at our home! It was a beautiful condo. Everything was very clean and up to date. I would definitely go back and spend another vacation here. It’s not a place for anyone that has a hard time doing stairs due to not having an elevator. The view is amazing and the complex is very quite. Thank you so much for the lovely review! I’m sorry our complex doesn’t have elevators. For sure, the 2 flights of stairs can be difficult if your not used to doing stairs. This was our first visit to Galveston and first time renting a condo! The whole experience was amazing. Yolanda was very helpful and thorough! The condo was perfect for our family of 5. The view from the condo was awesome! We will definitely use your services again! Thank you!! You made my day!! We’d love to have you stay again, for sure! I was extremely nervous to use VRBO but have had many friends convinced me to give it a try. Pleased to say, my first time using VRBO was amazing. My stay at the Docs Quarters @ the Dawn was extremely relaxing. The condo was very clean, pleasantly decorated, and well kept. The owner was very friendly meeting all my needs and responded to questions within a very reasonable time. I will definitely rent from this owner again! Thank you for the lovely review! Your Guest review makes us feel really good and want us to continue to enjoy providing for our guests! Thank you again! This is the second year for us to come to your property after thanksgiving. We so enjoy it. May not be able to come next year as there is no elevator. Hard to get up and down those steps. Thank you for sharing your home with us. No worries, I have another condo that is a 2 bedroom ground level unit! It’s also just as beautiful! Thank you again for continuing to enjoy our home! Moody Gardens can be experienced with its Discovery Museum. You can also immerse yourself at the MG3D, 4D and Ridefilm theaters. Enjoy beautiful Galveston Bay on the Colonel Paddlewheel Boat and a little summer fun on the new lazy river at beautiful Palm Beach. Finally, take a swing at the Moody Gardens Golf Course! Plenty of great seafood restaurants! The Strand is close enough for you to enjoy the atmosphere or shop till you drop. Miniature golfing very close to the condo as well as a fishing pier along the seawall.